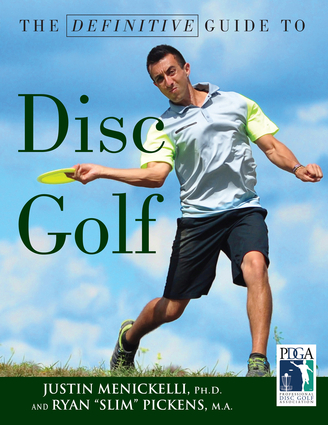 Three Paths to Better Disc Golf- A School of Disc Golf Book! Disc Golf is a simple yet complex and multifaceted game. It’s one of the reasons we can play for decades – primarily on the same local courses – without losing interest. We can always do better, and most avid golfers continually strive to shoot lower scores. The good news is that a disc golfer can improve his or her game in so many different ways. It’s not just about distance and accuracy (although both are important). The philosophical approach to better disc golf, which encourages players to examine the big picture. Why do you play? What are you thinking about, really, as you prepare for each throw? The strategic approach to better disc golf, comprised primarily of the principles of game management and playing ‘smarter’ by identifying and eliminating chronic mental errors. The tactical approach to better disc golf, where a player improves mostly by learning new types of throws and refining and strengthening existing ones. As a means of demonstrating the differences between these aspects of golf and why players of all skill levels can still improve in at least one of them, I’ve written a new book. It’s called Three Paths to Better Disc Golf and you can preview it now for free. Disc golf is fun no matter what, but reaching new scoring plateaus is also extremely rewarding. With nearly 30 chapters that span all aspects of disc golf there are bound to be at least a few that help even the most seasoned player gain new insights. If you’re shopping for a gift for a disc golf fanatic and want a great alternative to discs or a gift certificate, here y’go. Golfers need towels, sometimes almost constantly. And we usually need pants as well- or at least shorts. So it should come as no surprise that someone decided to save us all the small hassles of remembering the towel, and retrieving the towel, and stowing the towel, by combining them into one. If you also have trouble remembering your pants, you’ve got bigger issues. Paul Dorn, the inventor of the Wocket(TM) golf pants, launched a Kickstarter campaign to promote his creation and fund early production runs. Support the campaign and you can be one of the first to get your hands on this most functional piece of golf apparel. How did you discover the growing disc golf market as a possible market for your product? As a kid, I used to play disc golf at Chastain Park, here in Atlanta. I played ultimate frisbee in college. And I’ve watched a group of guys grow old together while playing their self-made course through the park and woods in my neighborhood. And my love for throwing discs is the same as it was when I was a kid. So, you would think that making the connection between disc golf and Wocket™ would be a natural, but it wasn’t. I discovered it using some Google Adwords tools. It was like I needed to be hit in the head with a 200g disc. When I saw “disc golf” in the search terms recommendations, I got really excited, because I understand the sport, have always enjoyed it and appreciate how much skill it requires. So, it was kinda like running into an old friend. I also had the realization that our pants, as they are now, would work really well for disc golf players. With golf slowly declining as a recreational sport and disc golf seeing strong growth, where do you see the two sports in 20 years? Well, I would hope that they would both continue to grow. But, I don’t see golf growing much, unless they deal with the pace of play problem and make it more accessible to young people. Golf has lost 5 million players in the last six years, while the pace of the average round has increased by one hour. It’s just too long and unreasonable to play often. Disc Golf, an equally challenging sport, is more affordable and accessible and doesn’t require a course, if you use your imagination. So, I see disc golf growing steadily over the next 20 years. At the moment, they are trending in opposite directions and I would expect that to continue, unless golf addresses its issues. Have you considered designing products with disc golf specifically in mind, in terms of fashion, utility, or both? Yes, after participating in a few disc golf discussion groups, we are looking into designing pants for the market. Our current pants, shorts and skorts will work great, as is, and truly help disc golfers, but the cultures and styles are obviously different. I am an avid golfer and am very passionate about the game, but culturally, I would probably fit in better with the disc community. So, it would be fun and exciting to really tap into the mindset and specific needs of disc golfers’ play and experience. We’d love to make disc golf specific pants and will continue to explore the opportunity and look to the community for insights and guidance, as we do so. It’s a great sport. And if the market is viable, we will make apparel to meet it. In the meantime, we have launched and will continue through the summer and fall with very universal/casual-styled pants with performance fabrics and utility that will serve both types of avid shot shapers! I believe the idea behind Wocket is a great one, and plan to review a pair when they become available. After checking out the site and looking at the various models or shorts, skorts, and pants, I think they look great as well. There are plenty of disc golfers who would proudly wear them. That being said, I really liked Paul’s answer to the last question and believe that a model or pants and shorts designed specifically for disc golfers would be a huge hit. Style-wise these might be a bit more casual. Function-wise, what would you like to see in addition to the towel? I’m sure Paul and co. would love to hear your ideas.